Materials and methods: In total, 71 edentulous patients with severely atrophic maxillas without sufficient bone volumes for placing dental implants, or when it was possible to place only two implants in the anterior area (minimal diameter 3.5 mm and length of 8 mm) and less than 4 mm of bone height subantrally, were randomised according to a parallel group design to receive zygomatic implants (35 patients) to be loaded immediately vs grafting with a xenograft, followed after 6 months of graft consolidation by placement of six to eight conventional dental implants submerged for 4 months (36 patients). For immediate loading, zygomatic implants had to be inserted with an insertion torque superior to 40 Ncm. Screw-retained metal reinforced acrylic provisional prostheses were provided, to be replaced by definitive Procera Implant Bridge Titanium prostheses (Nobel Biocare, Göteborg, Sweden), with ceramic or acrylic veneer materials 4 months after initial loading. Outcome measures were: prosthesis, implant and augmentation failures, any complications, quality of life (OHIP-14), patients' number of days with total or partial impaired activity, time to function and number of dental visits, assessed by independent assessors. Patients were followed up to 1 year after loading. Results: No augmentation procedure failed. Five patients dropped out from the augmentation group. Six prostheses could not be delivered or failed in the augmentation group vs one prosthesis in the zygomatic group, the difference being statistically significant (difference in proportions = -16.5%; P = 0.045; 95% CI: -0.34 to -0.01). Eight patients lost 35 implants in the augmentation group vs two patients who lost four zygomatic implants, the difference being statistically significant (difference in proportions = -20.1%; P = 0.037; 95% CI: -0.38 to -0.02). A total of 14 augmented patients were affected by 22 complications, vs 28 zygomatic patients (40 complications), the difference being statistically significant (difference in proportions = 34.8%; P = 0.005; 95% CI: 0.12 to 0.54). The 1-year OHIP-14 score was 3.93 ± 5.86 for augmented patients and 3.97 ± 4.32 for zygomatic patients with no statistically significant differences between groups (mean difference = 0.04; 95% CI: -2.56 to 2.65; P = 0.747). Both groups had significantly improved OHIP-14 scores from before rehabilitation (P < 0.001 for both augmented and zygomatic patients). On average, the number of days of total infirmity was 7.42 ± 3.17 for the augmented group and 7.17 ± 1.96 for the zygomatic group, the difference not being statistically significant (mean difference = -0.25; 95% CI: -1.52 to 1.02; P = 0.692). The number of days of partial infirmity were on average 14.24 ± 4.64 for the augmented group and 12.17 ± 3.82 for the zygomatic group, the difference being statistically significant (mean difference = -2.07; 95% CI: -4.12 to -0.02; P = 0.048). The mean number of days that needed to have a functional prosthesis was 444.32 ± 207.86 for augmented patients and 1.34 ± 2.27 for zygomatic patients, the difference being statistically significant (mean difference = -442.98; 95% CI: -513.10 to -372.86; P < 0.001). The average number of dental visits was 19.72 ± 12.22 for augmented patients and 15.12 ± 5.76 for zygomatic patients, the difference not being statistically significant (mean difference = -4.61; 95% CI: -9.31 to 0.92; P = 0.055). Conclusions: Preliminary 1-year post-loading data suggest that immediately loaded zygomatic implants were associated with statistically significantly fewer prosthetic failures (one vs six patients), implant failures (two vs eight patients) and time needed to functional loading (1.3 days vs 444.3 days) when compared to augmentation procedures and conventionally loaded dental implants. Even if more complications were reported for zygomatic implants, they proved to be a better rehabilitation modality for severely atrophic maxillae. Long-term data are absolutely needed to confirm or dispute these preliminary results. Conflict-of-interest statement: This study was originally supported by Nobel Biocare (Göteborg, Sweden), the manufacturer of the implants, and of the provisional and definitive prosthetic components used in this study, which were provided free to the patients; however, before any results were known, Nobel Biocare withdrew the financial support and recruitment had to be stopped. Tecnoss (Giaveno, Italy) kindly donated the bone substitutes and the membranes, whereas Global D (Brignais, France) donated the osteosynthesis screws. Data property belonged to the authors and the manufacturers in no means interfered with the publication of the results. Purpose: To evaluate the long-term effectiveness of 6.6 mm long flapless-placed single implants loaded immediately or early loaded at 6 weeks. Materials and methods: Thirty patients each received two single Nanotite External Hex Biomet 3i implants, which were then randomly allocated to be either immediately or early loaded, according to a split-mouth design. Implants had to be inserted with a torque superior to 40 Ncm. Provisional crowns were put in slight occlusal contact and replaced by definitive crowns 3 months after loading. Patients were followed for 9 years after loading. Outcome measures were implant failures, biological and biomechanical complications, peri-implant marginal bone level changes and patient preference. Results: A total of 29 implants were immediately loaded, while 31 were early loaded. Nine years after loading, three patients dropped out. One implant failed in each group within 2 months after loading. One patient asked for the immediately loaded crown to be remade for aesthetic reasons and then again to have both metal-ceramic crowns replaced by full ceramic crowns. Another patient had his immediately loaded crown remade after repeated debonding. Six patients from each group experienced complications, the difference being not statistically significant (difference of proportions = 0.00; 95% CI -0.20 to 0.20, P = 1.000). Peri-implant bone loss was 0.60 mm for patients with immediately loaded implants and 0.46 mm for early loaded ones, which was not significantly different (mean difference = 0.14 mm, 95% CI -0.13 to 0.41, P = 0.283). All but one patient had no preference for either procedure after 9 years. Conclusions: Flapless-placed 6.6 mm long single implants can be immediately loaded and remain successful up to 9 years after loading. Conflict-of-interest statement: This study was initially supported by a grant from Biomet 3i, which also provided free implants and related prosthetic components. Zimmer-Biomet then decided that this study was of no interest and stopped their funding, so the study became completely self-supported. Data property always belonged to the authors and by no means did the manufacturer interfere with the conduct of the trial or the publication of its results. Purpose: To evaluate whether 6 mm long × 4 mm wide dental implants could be an alternative to implants of at least 10 mm long placed in bone augmented with bone substitutes in posterior atrophic jaws. Materials and methods: A total of 20 patients with bilateral atrophic mandibles, and 20 patients with bilateral atrophic maxillae, having 5 mm to 7 mm of bone height below the maxillary sinus or 6 mm to 8 mm above the mandibular canal, had their side of the jaws randomly allocated according to a split-mouth design. They were allocated to receive one to three 6 mm long × 4 mm wide implants, or implants of at least 10 mm long in augmented bone by two different surgeons at different centres. Mandibles were vertically augmented with interpositional equine bone blocks and resorbable barriers, and implants were placed 3 months later. Maxillary sinuses were augmented with particulated porcine bone via a lateral window and implants were placed simultaneously. After 4 months, all implants were submerged and loaded with provisional prostheses. Four months later, definitive prostheses were delivered. Outcome measures were prosthesis and implant failures, any complication and radiographic peri-implant marginal bone level changes. Results: Five patients (three treated in mandibles and two in maxillae) dropped out before the 3-year post-loading follow-up. Two short maxillary implants affected by peri-implantitis failed together with their prosthesis vs three mandibular prostheses that could not be placed on implants at least 10 mm long due to graft failures; one was associated with the loss of three implants because of infection. There were no statistically significant differences in implant (difference in proportions = 0.000; 95% CI: -0.140 to 0.140; P = 1.000) and prosthesis failures (difference in proportions = 0.057; 95% CI: -0.094 to 0.216; P = 0.625). In total, 18 complications occurred in 13 patients at augmented sites vs four complications in three patients with 6 mm long implants. Significantly more complications occurred at grafted sites in mandibles (difference in proportions = 0.353; 95% CI: 0.005 to 0.616; P = 0.031), but not in maxillae (difference in proportions = 0.222; 95% CI: -0.071 to 0.486; P = 0.219). In mandibles, patients with 6 mm long implants lost an average of 1.25 mm of peri-implant bone at 3 years vs 1.54 mm in patients with implants of at least 10 mm long. The difference was statistically significant (mean difference = 0.29 mm; 95% CI: 0.08 to 0.51 mm; P = 0.010). In maxillas, patients with 6 mm-long implants lost an average of 1.28 mm of peri-implant bone at 3 years vs 1.50 mm in patients with implants of at least 10 mm long. The difference was statistically significant (mean difference = 0.22 mm; 95% CI: 0.08 to 0.35 mm; P = 0.003). Conclusions: Results at 3 years after loading indicate that 6 mm long implants with a conventional diameter of 4 mm achieved similar, if not better, results than longer implants placed in augmented bone. Short implants might be a preferable choice to bone augmentation, especially in posterior mandibles, since the treatment is faster, cheaper and associated with less morbidity. However, data obtained 5 to 10 years after loading are necessary before making reliable recommendations. Purpose: To evaluate whether there is a difference in aesthetic outcomes positioning immediate post-extractive implants in the natural position (where the tooth should have been in relation to adjacent teeth/implants) or about 3 mm more palatally. Materials and methods: Just after tooth extraction, 30 patients requiring one single immediate maxillary post-extractive implant, from second to second premolar, were randomly allocated to receive either an implant positioned in the natural "central" position where the tooth should have been (central group; 15 patients) or about 3 mm more palatally (palatal group; 15 patients) according to a parallel group design at three different centres. When needed, sites were reconstructed and bone-to-implant gaps were filled with granules of anorganic bovine bone, covered by resorbable collagen barriers. Implants were left submerged for 4 months and rehabilitated with provisional crowns, replaced after 4 months by metal-ceramic definitive crowns. Patients were followed to 1 year after loading. Outcome measures were: crown and implant failures, complications, aesthetics assessed using the pink esthetic score (PES), peri-implant marginal bone level changes and patient satisfaction, recorded by blinded assessors. Results: Two patients from the palatal group dropped-out up to 1 year after loading. One implant failed in each group (6.7%), the difference being not statistically significant (difference in proportion = -0.01; 95% CI -0.20 to 0.18; P (Fisher's exact test) = 1.000). One patient from the central group was affected by one complication, vs two palatal group patients (two complications); the difference being not statistically significant (difference in proportion = -0.09; 95% CI -0.32 to 0.15; P (Fisher's exact test) = 0.583). One year after loading, the mean PES was 9.93 ± 2.67 for the central and 8.75 ± 4.37 for the palatal group; the difference being not statistically significant (mean difference = 1.18; 95% CI: -1.87 to 4.23; P (t test) = 0.427). One year after loading, patients in the central group lost on average 0.23 ± 0.17 mm of peri-implant marginal bone and those of the palatal group 0.24 ± 0.25 mm, the difference being not statistically significant (mean difference = -0.01; 95% CI: -0.23 to 0.21; P (t test) = 0.926). Patients in both groups were equally satisfied at 1 year after loading for both function and aesthetics (P (Mann-Whitney U test) = 0.494 and P (Mann-Whitney U test) = 0.076, respectively). Conclusions: These preliminary results suggest that positioning of immediate post-extractive implants 3 mm more palatally is not improving aesthetics, however, the sample size of the present study was limited, thus larger trials are needed to confirm of reject the present findings. Conflict-of-interest statement: The manufacturer of the implants - Mozo-Grau Ticare, Valladolid, Spain - used in this investigation, donated the implants and partially supported this trial. However, data belonged to the authors and by no means did the sponsor interfere with the conduct of the trial or the publication of its results. Purpose: To compare planning and patient rehabilitation using 3D implant planning software and dedicated surgical templates with conventional freehand implant placement for the rehabilitation of partially or fully edentulous patients using flapless or mini-flap procedures and immediate loading. Materials and methods: Patients requiring at least two implants to be restored with a single prosthesis, having at least 7 mm of bone height and 4 mm in bone width were consecutively enrolled. Patients were randomised according to a parallel group study design into two groups: computerguided group or conventional freehand group. Implants were loaded immediately with a provisional prosthesis, replaced by a definitive prosthesis 4 months later. Outcome measures assessed by a blinded independent assessor were: implant and prosthesis failures, any complications, marginal bone levels, number of treatment sessions, duration of treatment, post-surgical pain and swelling, consumption of pain killers, surgical and prosthetic time, time required to solve complications, and patient satisfaction. Patients were followed up to 5 years after loading. Results: Ten patients (32 implants) were randomised to the computer-guided group and 10 patients (30 implants) were randomised to the freehand group. At the 5-year follow-up examination one patient of the computer-guided group and one of the freehand group dropped-out (both moved to another country). No prostheses failed during the entire follow-up. Two implants failed in the conventional group (6.6%) vs none in the computer-guided group (P = 0.158). Ten patients (five in each group) experienced 11 complications (six in the computer-guided group and five in the freehand group), that were successfully solved. Differences between groups for implant failures and complications were not statistically significant. Five years after loading, the mean marginal bone loss was 0.87 mm ± 0.40 (95% CI: 0.54 to 1.06 mm) in the computer-guided group and 1.29 mm ± 0.31 (95% CI: 1.09 to 1.51 mm) in the freehand group. The difference was statistically significant (difference 0.42 mm ± 0.54; 95% CI: 0.05 to 0.75; P = 0.024). Patient self-reported post-surgical pain (P = 0.037) and swelling (P = 0.007) were found to be statistically significant higher in patients in the freehand group. Number of sessions from patient's recruitment to delivery of the definitive prosthesis, number of days from the initial CBCT scan to implant placement, consumption of painkillers, averaged surgical, prosthetic, and complication times, were not statistically significant different between the groups. At the 5-year followup, all the patients were fully satisfied with the function and aesthetics of their definitive prostheses. Conclusions: Both approaches achieved successful results over the 5-year follow-up period. Statistically higher post-operative pain and swelling were experienced at sites treated freehand with flap elevation. Less marginal bone loss (0.4 mm) was observed in the computer-guided group, at 5 years follow-up. Conflict-of-interest statement: This trial was completely self-funded and all the authors declare no conflicts of interest. Purpose: To report the 5-year clinical and aesthetic outcomes of a novel surgical-prosthetic approach for the treatment of buccal soft tissue dehiscence around single dental implants. 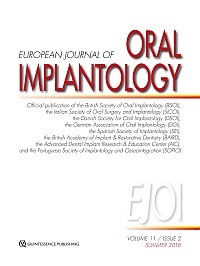 Materials and methods: Twenty patients with buccal soft tissues dehiscence around single implants in the aesthetic area were treated by removing the implant-supported crown, reducing the implant abutment, coronally advanced flap in combination with connective tissue graft and final restoration. After the first year, patients were recalled three times a year until the final clinical re-evaluation performed 5 years after the final prosthetic crown. Complications, bleeding on probing (BoP), peri-implant probing depth (PPD), clinical attachment level (CAL), keratinized tissue height (KTH), soft tissue coverage and thickness (STT), patient satisfaction (VAS) and aesthetic assessment (PES/WES) were evaluated 5 years after the final restoration. Results: Of the 20 patients enrolled in the study, 19 completed the study at 5 years. A total of 99.2% mean soft tissue dehiscence coverage, with 79% of complete dehiscence coverage, was achieved at 5 years. A statistically significant increase in buccal soft tissue thickness (0.3 mm 0.1-0.4 P < 0.001) and keratinized tissue height (0.5 mm 0.0-1.0; P < 0.001) at 5 years with respect to 1 year was demonstrated. The patient aesthetic evaluation showed high VAS scores with no statistical difference between 1 year and 5 years (8.75 ± 1.02 and 8.95 ± 0.91 respectively). A statistical significant PES/WES score improvement was observed between baseline and 5 years (9.48 ± 2.68; P < 0.001), but not between 1 and 5 years. Conclusions: Successful aesthetic and soft tissue dehiscence coverage outcomes were well maintained at 5 years. The strict regimen of post-surgical control visits and the emphasis placed on the control of the toothbrushing technique could be critical for the successful long-term maintenance of soft tissue dehiscence coverage results. Purpose: To present a case report of autogenous transplant of two impacted mandibular canines. Materials and methods: A 12-year-old girl, with vestibular impaction of mandibular left and right canines had them extracted and transplanted in the anatomically corrected sites, after an unsuccessful orthodontic treatment including surgical exposure. Results: After 2 years the teeth are stable and their vitality is maintained. Conclusions: In this case the transplantation of the mandibular canines was successful and maintained the vitality of the transplanted teeth for at least 2 years. By preserving the periodontal ligament is it possible to re-establish a functional tooth unit, which allows a physiologic growth of the jaws. Purpose: To present a case of a woman referred for the management of displacement of one implant in her right posterior mandible that had occurred three days previously. Materials and methods: After implant placement, the practitioner was no longer able to detect the implant and inserted a second one at the same site without taking a control radiograph. At the end of surgery, when a radiograph was finally taken, the first implant appeared displaced into the mandible body. The patient suffered total paresthesia on the right lower lip and chin. A flap was raised and bone osteotomies were performed on the lateral side of the mandible to create a rectangular cortical bone window that was removed. The implant was stuck by the second implant placed coronally, and only after unscrewing this second implant was it possible to remove the first one. Results: After 18 months, the patient recovered full sensitivity. Conclusions: In cases of implant displacement, it is always recommended that appropriate radiographs are performed to visualise where the implants could have been displaced in order to avoid more serious consequences. Conflict-of-interest notification: The authors declare no financial relationships and therefore no conflict of interest. This section presents a brief review of articles on dental implants considered of special interest for the reader, in order to encourage the developing of research, the interest for data analysis and the attention to scientific publications. Your comments are welcome. Please contact Dr Michele Nieri at michelenieri@gmail.com.